Steamboat Springs Olympian and Breckenridge resident Taylor Gold races in the men's open class of the Slash and Burn Banked Slalom on Saturday, March 16 at the Bashor Bowl at Steamboat Resort. Steamboat Springs 2014 Olympic snowboarder Taylor Gold has a long list of tricks typed up on his phone. 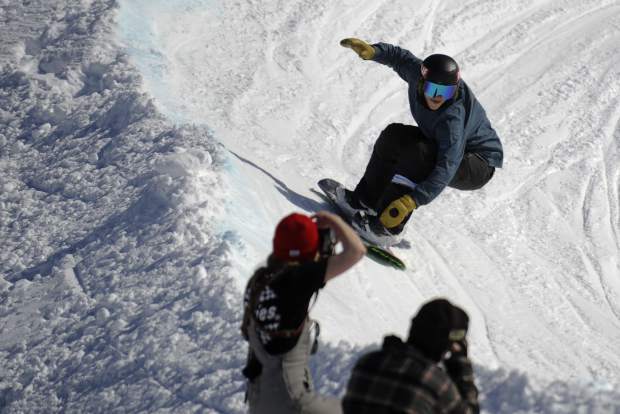 Three years of being injured gave the Breckenridge resident a lot of time to sit on the couch and watch other snowboarders, taking note of new tricks and how he wanted to make them his own. Gold’s future has been in question for a while, but he’s remained on the U.S. team’s roster because coaches know that no one else has the same effortless flare riding the halfpipe. It’s a unique style that scores well with the judges. Gold shattered his kneecap on a rock in Silverton in January 2016. Since then, he’s occasionally returned to snow but never for a full season. Following his first surgery, Gold returned to the snow to take home a bronze medal at the 2017 Winter X Games but never felt like it was fully healed. He underwent a scope surgery to remove the scar tissue that spring. In the meantime, Gold decided to fix his shoulder, which was frequently dislocated. He tried to return in fall 2017 during a camp in Switzerland, and the result led to a devastating conclusion. Instead of making a run for his second Olympic team, Gold concluded that he needed more time to recover. Gold had his third knee procedure in January 2018, when the wire and screws were removed from his kneecap. In February, his sister, Arielle Gold, would take home an Olympic bronze medal. “Watching these events go by and Arielle doing well, I’ve been wanting to be out there so badly,” Gold said. “When injury lasts that long of a time, you expect it won’t ever feel the same or do the same things again. Surgeries had a proven track record of giving Gold a false hope for the future. His dad, Ken Gold, had a new idea: look into stem cell therapy. Ken had done same-day stem cell treatments in Broomfield at the Regenexx clinic for a back injury and wondered if they could help Taylor. The U.S. has strict guidelines on stem cell use, so professional athletes like Kobe Bryant, Peyton Manning and Andrew Luck have gone offshore to Europe for treatments to promote the healing of their injuries. Europe is a hub for professional athletes to receive an enhanced version of platelet-rich plasma therapy. Platelets are blood cells that are responsible for initiating a blood clot where there is a bleed in the body. Platelets also release growth factors and proteins that can accelerate the healing process of muscles, tendons and ligaments in the body. During plasma therapy, a patient’s blood is filtered through a centrifuge to separate the platelets from other blood cells. The platelets, now at a higher concentration, are then injected back into the patient’s injured area. Plasma therapy is a subset of stem cell therapy, so athletes go abroad because, in Europe, doctors are able to manipulate the platelets and proteins extracted from the body using heat to increase its concentration and, therefore, increase the chances of healing. In the U.S., platelets must be reinjected without growth manipulation and within 24 hours. What Taylor Gold received through Regenexx was stem cell therapy. Bone marrow was removed from his hip, then specific stem cells, called mesenchymal cells, were taken from the bone marrow through a centrifugal process to ultimately be grown and reinjected into his knee. Mesenchymal cells are a type of stem cell that differentiates into bone, muscle, cartilage or fat cells in the marrow. The objective was to grow and strengthen tissues surrounding his knee, specifically the damaged cartilage surrounding his kneecap. Gold had to travel to Grand Cayman for his stem cell therapy since it involved a 10-day culturing process. The cells were grown outside of his body for 10 days in a lab, then frozen until approved by genetic testing for the procedure. “Grand Cayman is the only location in the world where culturing of stem cells is allowed,” Regenexx Cayman liaison Tristan Bennett said. Culturing stem cells can produce 100 to 1,000 times more cells than immediate reinjection therapies. The Food and Drug Administration prohibited Regenexx from culturing in the U.S. in 2008 because it’s considered as manufacturing a new drug. Gold received the treatment in spring 2018, then started a rehab process with Brad Jones, a highly regarded physical therapist for the U.S. snowboard team in California. Jones worked with Gold on isolating different muscle groups for strengthening around his knee. Since Gold saw Jones after several surgeries, Jones had to work to identify and undo damage in surrounding parts of his body. Gold spent a month in California working for 90 minutes with Jones, almost daily, which involved manual therapy on a treatment table, then strength training in the gym. He was at home on the snow, and he’d been missed. Gold’s rehabbing process ran through the remainder of summer 2018, limiting his time to train for the season. He returned to the Switzerland training camp in fall 2018, nervous, since it had been the place he had decided he couldn’t contend for the Olympics. But he rode the pipe with a strong, effortless finesse and no pain. The emotions overcame him. “I was maybe tearing up on the chair,” Gold said. His highest World Cup placement this season came in Laax, Switzerland, on Jan. 19, when he took 12th, but he had qualified the day before in second.